"Some years ago a man came into the office of the architects of our church building - Allen Collens & Willis of Boston- and had in his possession a valuable ancient relic on which he would like to raise some cash. 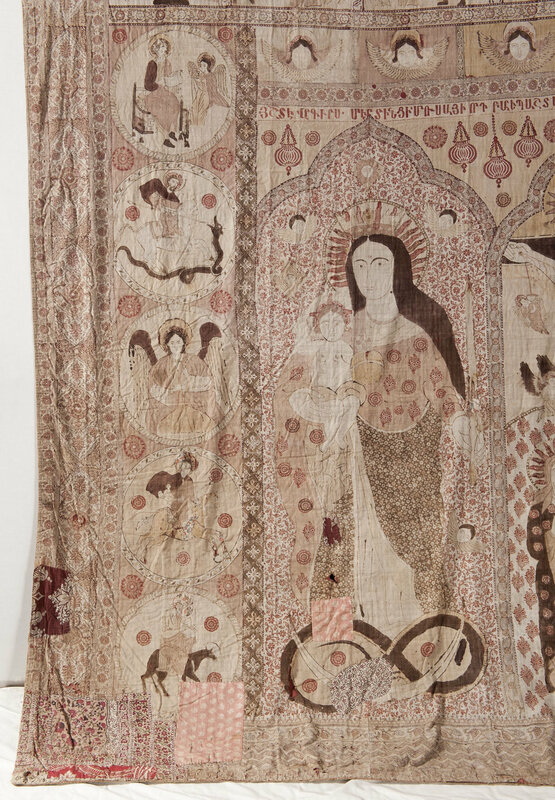 He thereupon produced this Armenian textile. He knew nothing about it but felt that it was very valuable. If the firm would advance him some money on it he would return at his earliest opportunity and redeem. The architects lent him a fair sum and the man departed. They have heard nothing from him since. When our church building was completed, the architects felt that the long left wall of Gordon hall needed some kind of decoration. 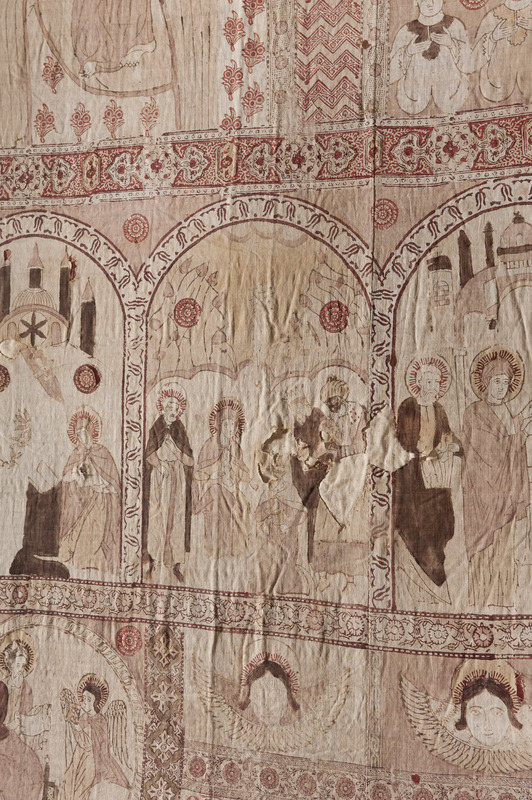 Accordingly they gave this textile to the church as a loan, to remain in our custody until the owner should appear and redeem it, or until the architects could legally sell it. "This curtain is in memory of Monsa of ( the city of) Mardin, son of the pious and God-loving Aslan. At the door (meaning the church) of St. George, in the year 1766." On the right in small letters: "This is the work of the chorister Jacob, from ( the city of) Tokat."" Mardin is a city of about 30,000 people in the southern part of Asiatic Turkey, about a hundred miles east by north of Abraham's old city of Haran (Gen. 11:31). Tokat, near the Black Sea in Asia Minor, is still famous for its textile printing. The First Baptist Church of Worcester was again extensively renovated in the 1980's. The Armenian altar curtain clashed with the updated design, and the textile curtain was returned to the original architectural firm. 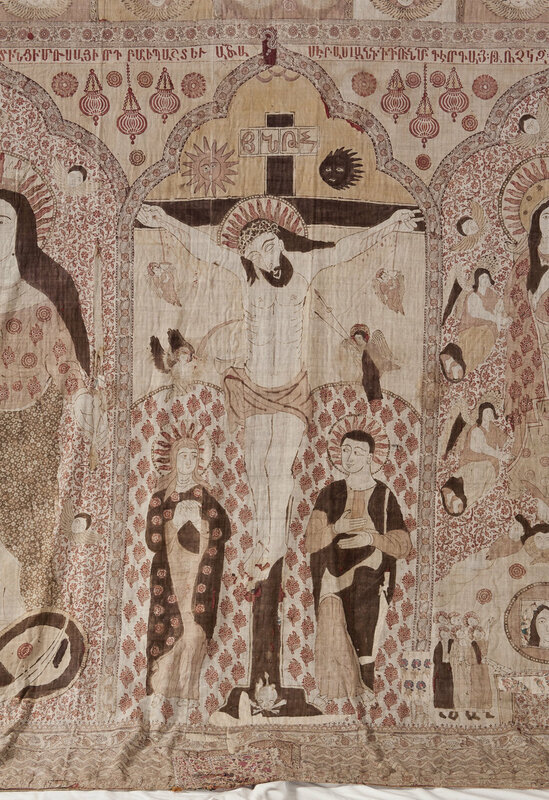 Mr. Harold B. Willis generously donated the altar curtain to the Armenian Library and Museum of America in 1990. 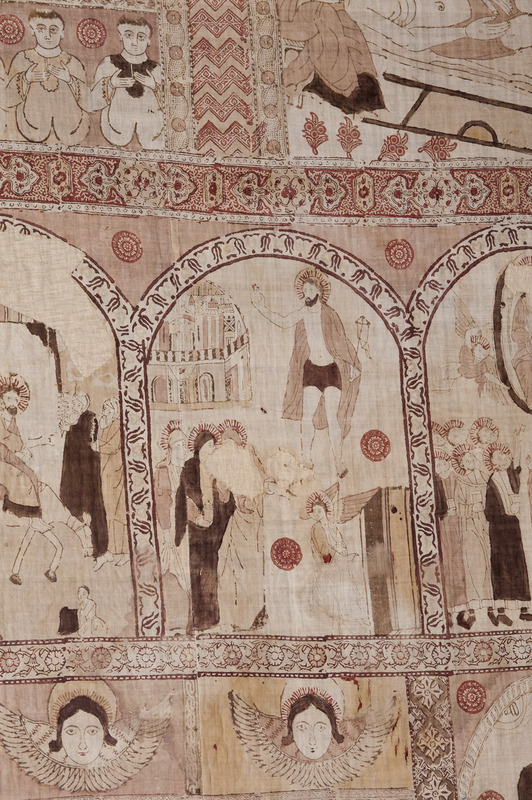 The curtain is one of the most important textiles in the museum's collection. 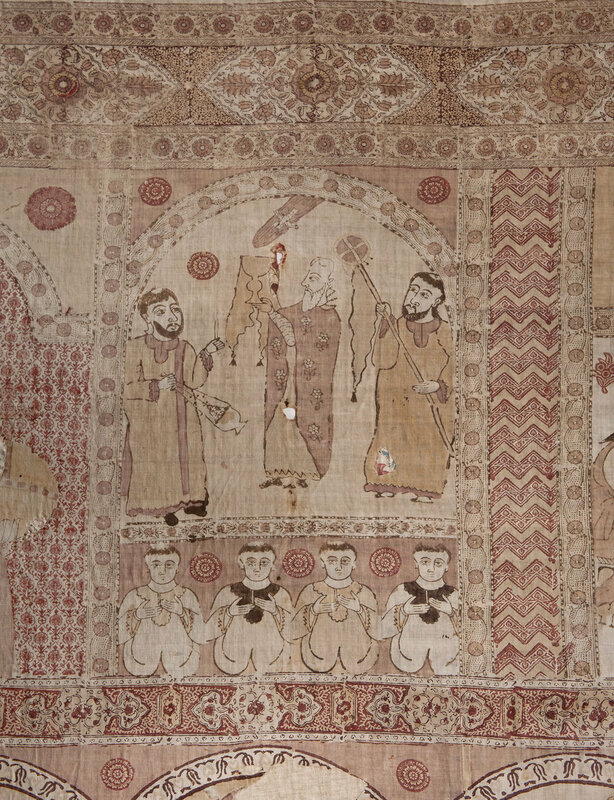 Other Armenian altar curtains similar in design to the Mardin curtain may be found in the museum collections in Venice, Jerusalem, Echmiadzin and Istanbul. 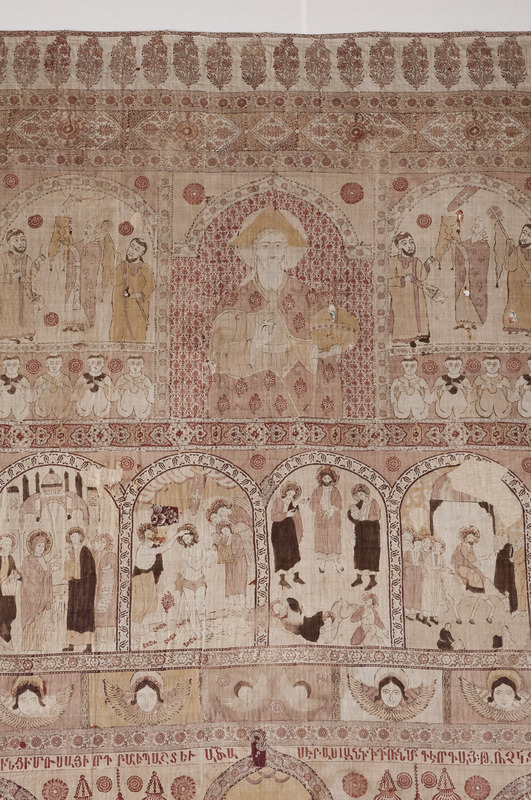 These sister curtains use the same motifs and artistic style, often in the same sequence, suggesting they were produced by either the same artisan or artistic school/workshop. One noticeable difference is the vibrant red colors of the other curtains, contrasting with the faded muted hues of the Mardin curtain. The Mardin curtain was on display in the Baptist Church for over 30 years with constant exposure to sunlight which faded the red tones. 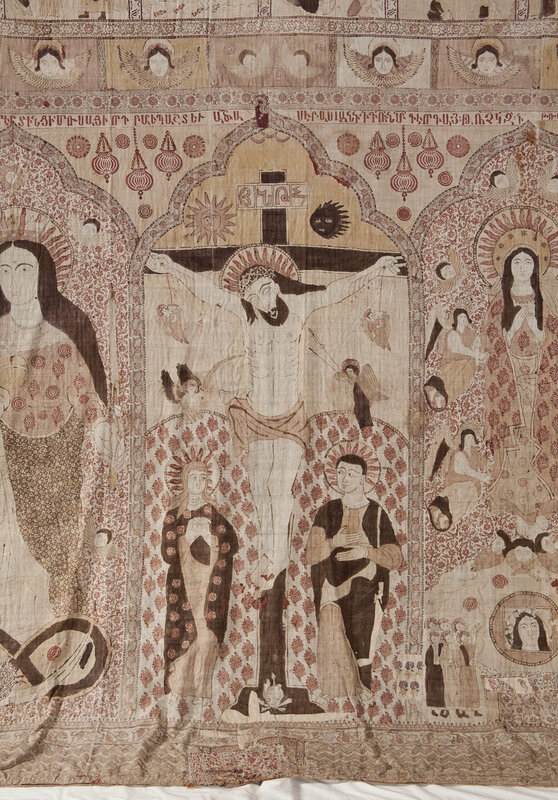 Despite this color loss, the curtain remains a exceptional example of Armenian religious art.